Sir Richard Arkwright was a British inventor and entrepreneur. He is considered to be the ‘father’ of the factory system that was started during the Industrial Revolution in England. Richard Arkwright was born in 23rd December 1732 at Preston, Lancashire, England. He did not belong to a very educated or financially well of family. He did not receive formal schooling and his cousin told him to read and write. He initially became a barber and slowly after some time he became interested in wig making business and owned a shop. His business slowly started to expand and he started to mix with many people from spinning and weaving industries and then he decided to join the textile industry. During the 1700s, England had a lot of colonies. England that time used to have controlled almost all over the world especially in Asia and America. England used to receive a lot of silk, cotton, tobacco, sugar, gold and also a lot of money. These resources made England very powerful. Out of all the goods that England used to receive, cotton was the most difficult resource. It used to take a lot of time to separate the seeds that the cotton had. Then the cotton had to be spun into thread and then finally be woven into cloth. These three laborious tasks were done by hand and were time-consuming. In England, the textile industry was a cottage industry. In a cottage industry all things are made out of hand, hence the process is slow and laborious. The raw cotton was first made into long pieces of yarn and then with the help of a spinning wheel, it was spun into thread. The treads were then woven so that it could be transformed into a loom to turn it into a fabric. In the 1760s, Richard Arkwright invented the spinning frame. It was a machine that could spin at one time 128 threads together. This invention was a very important invention as it saved a lot of time and labor. 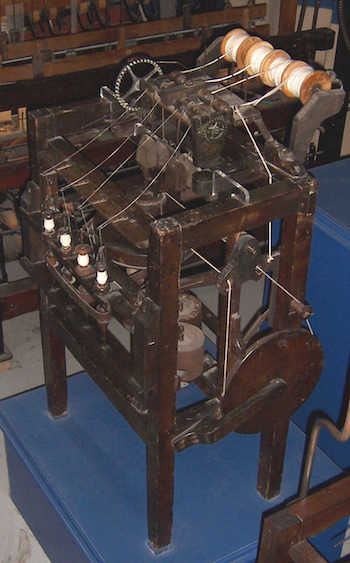 In the 1770s, Arkwright improved on the carding machine which existed previously. He tried to combine the spinning frame and carding machine together. In the early 1770s, Arkwright had joined the textile business to raise a lot of money and for mill construction. The spinning frame which he created was large in size and it needed some kind of power source to bring it into motion. They first tried it out with the horses but it did not work. Then a water mill was constructed. The motion of water was used to create energy for moving the spinning frame. This was then named as the ‘water frame’ where thread used to be spun. Apart from contributing hugely to England’s textile industry, he was a clever and hardworking man. Since he did not receive any formal education, he later worked hard and learned English grammar well enough to read and write. He was also appointed High Sheriff of the county in Derbyshire after George III. Richard Arkwright died in 3rd August 1792 at Cromford, United Kingdom. Richard Arkwright had to children, Susanna, and Richard Arkwright Junior. The Junior Arkwright was equally ambitious and hardworking like his father and followed his father’s steps in building his own career. He developed the factory system in an even better way than his father did.